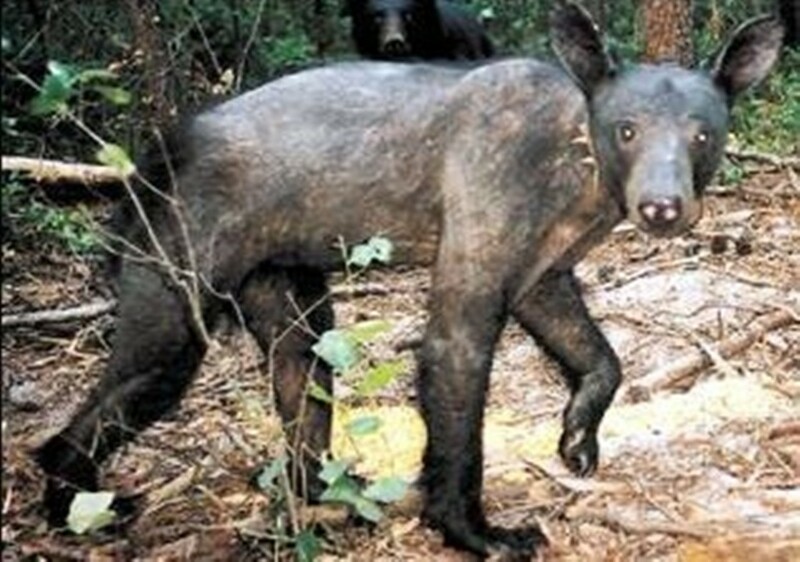 Mangy black bears aren’t that common, but those that get it do look particularly strange. Oh yeah, and they get confused with sasquatch. As a soon as a normally furred animal loses its hair for any reason, it will be confused and proclaimed to be some new species or possibly some proposed cryptid. Usually, some kind of wild or domestic dog with mange or even normal inherited hairlessness gets called a chupacabra. But this same name gets added to raccoons and even honey badgers. And then there are various Montauk monsters, which have all turned out to be raccoons. Side-striped jackals vary a lot in appearance, and some could be mistaken for either golden or black-backed jackals. Or African wolves. At this stage, we are still trying to figure out how to tell the difference between the African wolf and the golden jackal. About the only way I know to identify a side-striped jackal is to look for their distinctive white tail tip. They also tend to have broader skulls than other African wolf-like canids. 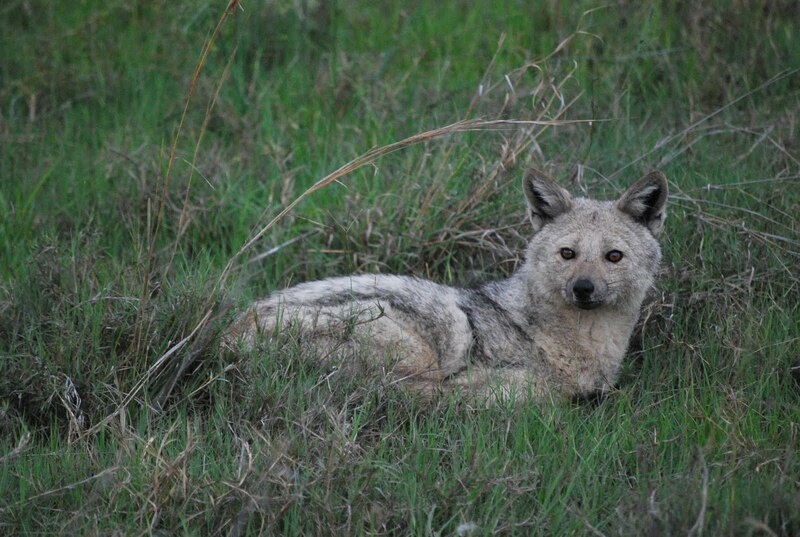 This particular smoky gray side-striped jackal looks a bit like a very old Norwegian elkhound. I’ve never seen a boxer without a black mask before. You have to look closely, but you can see the brindling on the legs. My guess is that this color has also been introduced through cross-breeding with those darn domestic dogs. Lots of free love in the genus Canis. Orinoco crocs are critically endangered. There could be as few as 250 left in the wild, although the numbers are likely higher than that. They live in the Orinoco River and Meta River basins of Venezuela and Colombia, which are not exactly the most stable countries in the world. As crocodiles go, I think these are the prettiest. I love to hear George Page’s voice on any nature documentary. Those were the halcyon days of Nature on PBS. Great name for a dog! This is another black-backed jackal of the Cape subspecies. This one is normally colored, but it lacks the distinct saddle back that gave the species its name. 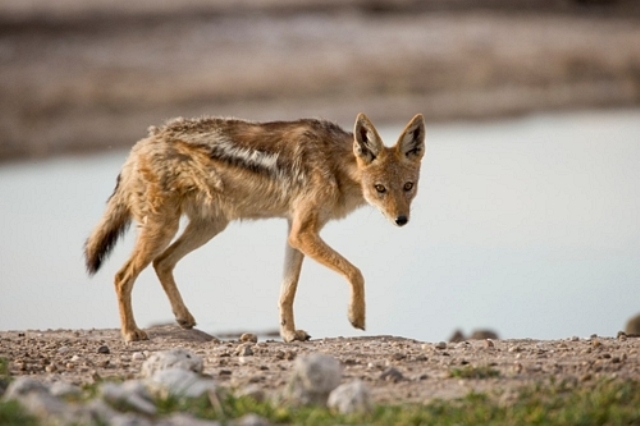 It still has stripes running down its side, but because it doesn’t have a white-tipped tail and a bulbous looking head, we know it is a black-backed jackal. I’m calling this color phase “sable,” because the gold hairs appear to be banded and mixed in with black, in a very similar way to the sable collie. An albino, with links to photos of another one in the comments. A golden one that has no black pigment on its coat. Color phases are not mentioned in any of the literature on black-backed jackals, but they clearly come in more colors besides the normal coloration. And the genetics of these phases are worth examining for a very simple reason: Black -backed jackals are the oldest extant species in the genus Canis. We might be able to glean some understanding of how different colorations in this genus evolved, simply by looking at this animal, which is fairly similar to the basal Canis from which all of these animals descended. For example, it might be that the golden phase is caused by the same genotype that causes recessive red (e/e) in domestic dogs. That finding would suggest that this color and those genes have been in the genus for a very long time– thereby predating yellow and red domestic dogs by millions of years. These animals are not chemically interfertile with other members of the genus, so these color phases were not introduced through cross-breeding with domestic dogs. If it has the same genetic basis, then it would be very unlikely that the exact same mutation affected domestic dogs and black-backed jackals at different times in history. If it is the same genetic basis, then this color is quite ancient– black backed jackals split off from the rest of the genus perhaps as early as 4.5 million years ago.